Viknesh Vijayenthiran April 1, 2016 Comment Now! 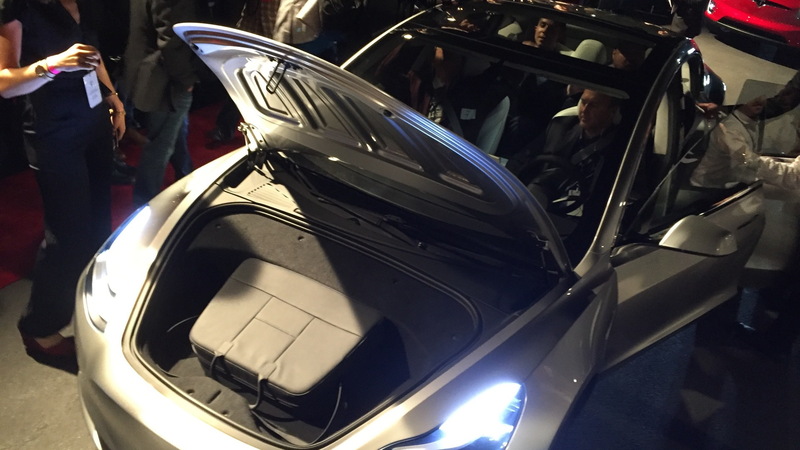 Tesla Motors’ [NSDQ:TSLA] Model 3 has been making headlines for the past several years but now it’s finally here. 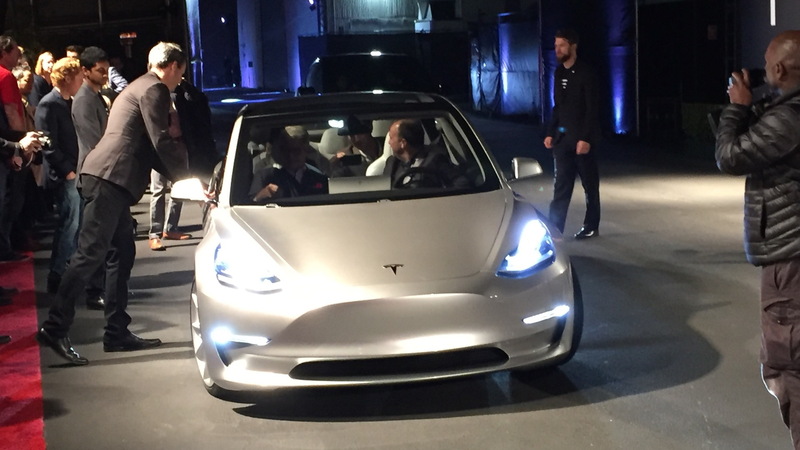 The BMW 3-Series-rivaling electric sports sedan was revealed tonight in Hawthorne, California and Tesla has been taking pre-orders since early this morning. According to the company, it's already racked up over 115,000 orders. 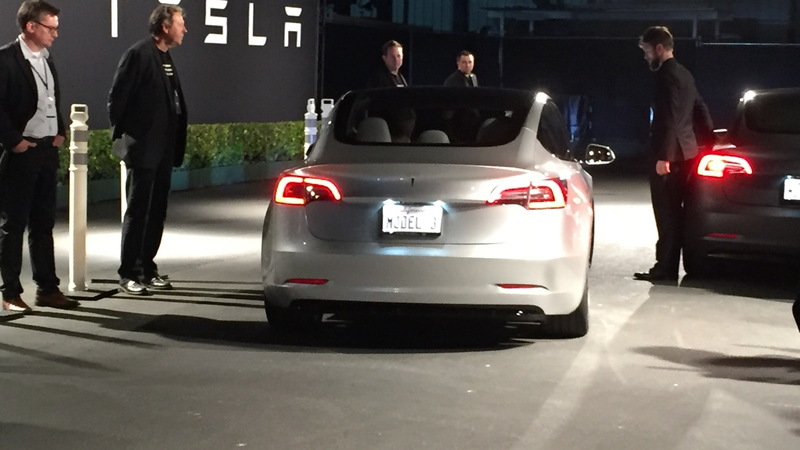 As previously confirmed by CEO Elon Musk, who was present at tonight’s reveal, deliveries of the Model 3 won’t commence until late 2017. When it arrives, Tesla promises a range of at least 215 miles and a starting price of $35,000 before incentives. Crucial to getting the price down to this level is Tesla’s plan to use its own batteries this time around, sourced from its Gigafactory under construction in Nevada. Base Model Es will be rear-wheel drive, but all-wheel drive and air suspension will be available options. Most will argue the Model S is a sharp looking sedan while the Model X is less so. The Model 3 is clearly from the Tesla family, but has some distinct Porsche Panamera design cues up front. Like the Model S and Model X, the Model 3 has pop-out door handles that improve aerodynamics by retracting into the car's body at speed. Inside the Model 3 takes a page from the BMW i3 electric car with a spartan interior seating five, and a 15-inch horizontal tablet-like touchscreen mounted on the center of the dashboard. Tesla says the screen is key to how it believes people will interact with its Autopilot self-driving system—currently a semi-autonomous driving system—in the future. The Tesla Roadster was quick, but the Model S is the fastest four-door sedan on the planet with its ludicrous speed. Tesla says the Model 3 will be quick with the base model running 0-60 mph in 6.0 seconds or less, with higher performance models being even quicker. 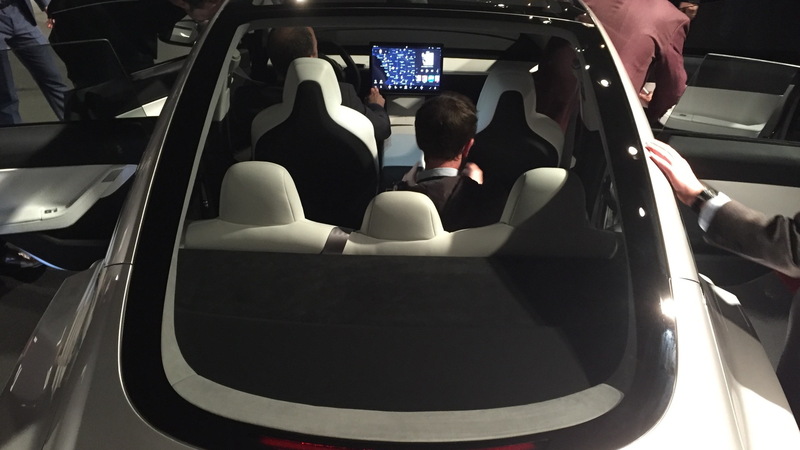 When it comes to tech Tesla hasn't said a lot, though we see that massive touchscreen on the dashboard. It did promise that every single Model 3 will come standard with its Autopilot hardware—the hardware necessary for a Tesla to be semi-autonomous—though it didn't say the software to enable that hardware would be standard. Safety has been a corner stone for Tesla since the Model S aced all safety tests earning five stars in every single category. The Silicon Valley automaker announced during the Model 3's reveal that it too will achieve a five-star safety rating in every single test. 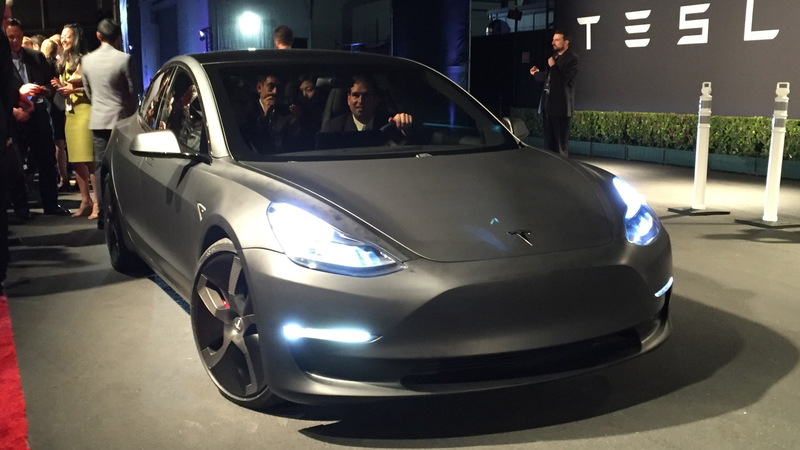 The Model 3 is the first model based on Tesla’s third-generation platform. This platform will also be used for a crossover-like model and possibly a new generation of Tesla’s first model, the Roadster sports car. Notably Tesla says the Model 3 is new from the ground up, and almost nothing has been shared with the Model S and Model X. The company says it didn't want to share parts, but rather it took what it learned from those previous models in making the Model 3. Tesla's being coy about certain Model 3 details, but has said it's not all-aluminum like the larger Model S, rather, it's a mix of steel and aluminum. The successful launch of the Model 3 represents a critical juncture for Tesla as the higher sales volume the car should generate is what the company is relying on for long-term viability. Tesla is anticipating sales of around 500,000 cars annually by the end of the decade, up from around a tenth of that figure at present. Importantly, the arrival of the Model 3 will also see Tesla transition from being a niche brand selling expensive cars to wealthy tech fans to a mainstream player offering affordable, compelling cars made in the United States. It has always been one of Musk’s goals with Tesla to make electric cars a credible option for mainstream buyers.